Multi-Functionality. There are six cookers, that all work to an excellent standard, in the shape, size, and price of one machine. The Utensils. With the Instant Pot IP-LUX60, you have access to a rice paddle, soup spoon and measuring cup. There’s no reason for you to say I fancy that recipe, I’ve got the ingredients, but I just don’t have what I need to make it with. Timer. You can put in your porridge oats and water the night before and wake up with nothing more to do than to pour it into your bowl and leave the dishes to soak. The Instant Pot IP-LUX60 6-in-1 Programmable Pressure Cooker has everything you could ever want from a cooker, well, everything you could ever want from six of them actually. Its functionality includes pressure cooker, sauté/browning, slow cooking, rice cooker, steamer and keep warm. All of these options allowing you to make whatever meal you can think of. You also get the recipe booklet included with the Instant Pot IP-LUX60 so that you can also make some new and exciting dishes. We rate this canner as the best value (see lowest price) for anyone on a budget looking for a quality product. You can't go wrong with the LUX60. The three temperature settings for browning/sautéing and slow cook mean that you don’t have to fit your schedule around the Instant Pot IP-LUX60. Rather, the Instant Pot IP-LUX60 cooks around what’s best for you. With functions such as ‘keep warm’ you can come back to your food whenever you’re ready. It will keep the food warm for approximately 10 hours which, let’s be honest, is plenty long enough. The ‘timer’ feature allows you to delay the Instant Pot IP-LUX60’s actual cooking of the food itself in the first place. Do you have some extra time in the morning but know that you won’t be back for dinner until much later? To avoid the temptation to go out and eat, prepare your meal in the morning, or even the night before if you don’t have time and set the timer accordingly. Doing so means that you can come home to the Instant Pot’s IP-LUX60 most-inviting aromas. The control pad is large and easy to use. 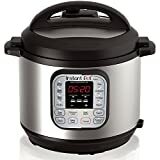 It’s labeled in such a way that you can immediately launch 1 of the 10 Smart Programs that you wish to enable to optimize the Instant Pot IP-LUX60 and the delicious tasting food that you get out of it. It is pretty straightforward to use and requires no guesswork. The fact that the Instant Pot IP-LUX60 meets the North American Electrical Standards and is UL/ULC certified – thanks to the inclusion of 10 proven security features–pressure regulator protection, excess pressure protection, anti-blockage vent, safety lid lock, lid close detection, leaky lid protection, extreme temperature and power protection, automatic pressure release control, automatic temperature control and high cooking temperature warningwill only put your mind more at ease when leaving it unattended so that you can work in peace. Upon unboxing the Instant Pot IP-LUX60 the first thing that I noticed straight away was the size. It amazed me that a tool with so many varied functionalities could be so compact and be so small. It was the perfect size for my kitchen, incidentally. I resolved to test it immediately and so after reading the recipe booklet-which comes in not only English but also Spanish, French and Chinese with meals that are as varied and colorful- I began gathering my ingredients together. I plugged it into the nearest socket, selected my favored smart program and turned it on. It was a breeze, and my meal came out flawlessly. To my surprise the meat was tender, and the green beans weren’t limp at all, despite being in a stew. The Instant Pot IP-LUX60 is also highly energy efficient, typically saving up to 70% energy (I’ve worked out that it saves me around 67.5%) and 70% of the cooking time, which is ideal when I’m rushing around and trying desperately to sort things out. The anti-blockage vent and lid close detection are two of the most useful safety devices that I’ve found on the Instant Pot IP-LUX60. Gone are the days of the lid not being properly secured. Before feature, opening the lid of your pressure cooker required you to wait for the pressure to drop and by that time your food had gone cold. The food could also get in the way of the vent causing an increase of pressure, and your food was too tough to eat or swimming in flavorless liquid. The Instant Pot IP-LUX60 also makes very little noise and generates little to no steam which makes concentrating on the important upcoming projects that much easier. I know how it simplifies my life. Buying the Instant Pot IP-LUX60 has revolutionized the way I see mealtimes. I no longer have to put my food into the cooker and wait for hours on end for my food to be ready-when I should be working but simply can’t concentrate. With the Instant Pot IP-LUX60, I can just put my food into it, wait for a short amount of time, and come back to my freshly cooked meal that comes out perfectly each time. The Instant Pot IP-LUX60 is an affordable way to bring healthy, luxurious food into your lifestyle. If this isn’t quite the model for you, consider reading our other Instant Pot reviews. There are other Instant Pot models you may find are better suited to your needs. This stainless steel cooking pot comes with several different components including the inner pot of the cooker, the sealing ring, the lid, and a steam rack. All of these parts are dishwasher safe which makes the entire process from beginning to end much easier and much faster. It is important to note that while most of the Instant Pot is dishwasher safe, you need to take care to keep the cooker base out of water. If it does happen to get wet by accident, you need to let it dry completely before plugging the device in or using it again. You can also contact customer support if you are unsure of what to do if this component gets wet. To clean the exterior of the Instant Pot, simply wipe it down with a warm, soapy cloth. Never use any kind of abrasive cleaners because this can cause significant damage to the surface of the pressure cooker. A toothbrush can also be used to clean the edges of the cooker much more effectively. The stainless steel inner pot can be treated like any other stainless steel you may have. It can be cleaned by hand or placed into the dishwasher. You can also clean the inner pot on a regular basis with a cup of white vinegar. Allow the vinegar to sit at the bottom of the inner pot for approximately five minutes and then pour out the vinegar and rinse the pot; this can also help with any smells that may be sticking. The Instant Pot IP-LUX60 has consistently been named as the best pressure cooker year-on-year by major retail outlets. For me, it’s a clear winner of its category. The only thing that lets it down is the rather high price tag – but it’s always going to be expensive to get the best. It is an energy efficient kitchen appliance that makes the cooking process so much faster and easier. Simply pressing a button can be the quick start to the cooking process you have been dreaming of. I bought this because it claims to do what I wanted and instead of buying several different items…..and the price attracted me also. Suffice it to say, it does everything exactly as described. I am very, very happy with my purchase. I’ll be sending my daughter off to college with her own, as she’ll be further away and not able to come home regularly. Great investment, great pricing. Can it be used for canning? Yes, but probably not the best product. I would look at the All American 921. I am looking to purchase one of the Instant Pots and cannot decide on the IP DUO60 or IP LUX60, I have found a DUO60 that has been updated and it has eggs, cake and timer the LUX60 has poultry and delay start but no cake and egg cooking…also the DUO60 does not have low pressure. Can you give me your opinion on which one is better or more useful than the other and how often and what would you use the low pressure for? For the money, the DUO60 is the best in my opinion. Can you still make cakes in the DU060 without the cake button function? I just bought it. Having read the reviews I can hardly wait to use it.